The EFITMENT Total Motion Rowing Machine is a single piston hydraulic rower designed for compact homes. This budget friendly rowing machine comes highly-rated by users, but at first glance doesn’t look that much different than all the other similarly priced rowing machines. Is there anything about this EFITMENT rower that sets it apart from the competition? 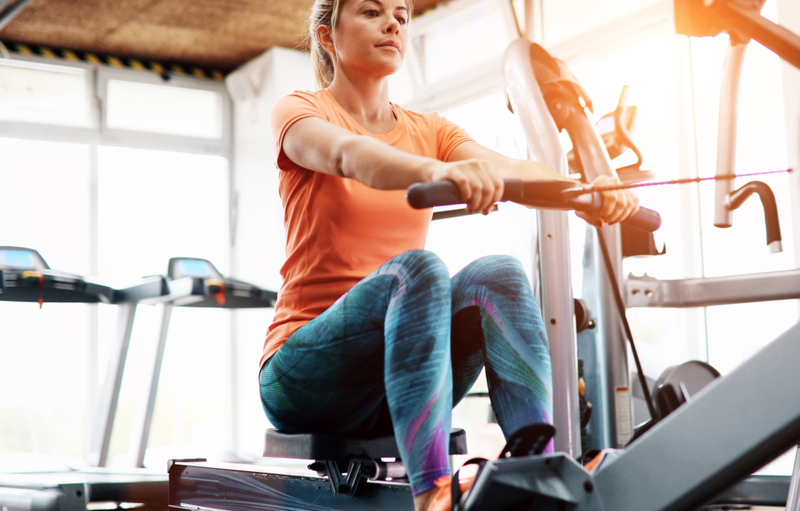 This review will show you everything this rowing machine has to offer, including the one feature I feel really sets this rower apart from the competition. In case you’re not familiar with hydraulic rowers, I want to start with a quick introduction to them. They are a little different than the rest of the rowing machines you’ve probably come across in the past. If you’re unfamiliar with these guys, they are the smallest and cheapest rowers of them all. The “hydraulic” part of their name comes from the piston utilized to provide the resistance. All rowers needs something for you to pull against for resistance and they are named based on how they provide said resistance. Hydraulic rowers use a piston. The other, larger rowers use either air, magnets, or water and are so named accordingly (I’m going to refer to these machines collectively as “full size rowers” from now on). For more info on full size rowers, check out my rowing machine buyers guide. Using a piston has advantages. First of all, the simple mechanism doesn’t take much space to use, so these rowers can be very compact. In fact, they’re almost half the length of full size rowers (4-5 ft long compared to 7-8 ft long). This is a huge advantage for people with limited workout spaces in their homes. Second, they are significantly less expensive than the full size machines. Most hydraulic rowers cost between $100-$300 where full size rowers cost $500 – $1000 and up. Folks on a tight budget can still usually find a hydraulic rower that will fit their budget. These rowing machines are also very quiet. The piston mechanism is almost silent (or should be) during use. For people who don’t like all the noise air rowers make, hydraulic rowers can be a nice alternative. Hydraulic rowers can have 1 or 2 pistons. Two piston systems can provide a little more overall resistance because each arm has its own piston, instead of both arms using the same one. The seats on these rowers can be stationary or sliding- nicer rowers usually have a sliding seat because it works your legs more and feels more comfortable. EFITMENT is a distributor and importer of budget fitness equipment manufactured in primarily in Taiwan and China. They offer a little bit of everything, from rowers and bikes to fitness accessories. They are the fitness equipment brand for Zoovaa, a larger family of imported brands. This rowing machine uses a single piston system. The piston is located under the rail near the footplates and is adjustable. The Total Motion Rowing Machine is adjusted by simply turning a dial on the piston, there are 12 different resistance levels. Some hydraulic rowers adjust their resistance by adjusting where the piston attaches to the arms. This manner is usually more cumbersome and takes a little longer. Being able to adjust your workout intensity by turning a dial on the piston is preferred. Most users agree the resistance provided by this rower is sufficient to get a good workout in. Something to keep in mind though- with all hydraulic rowers, as you workout for extended periods, the oil in the piston heats up and becomes less viscous, reducing the amount of resistance provided. You may have to gradually increase the resistance level to maintain the same intensity throughout your workout. Also, EFITMENT says their rower is only designed to be used for 20 minutes at a time because of the heat generated. You are supposed to let it cool down for at least 20 min before using it again. The seat on this rower does slide, which is a plus. Otherwise the seat is pretty standard issue here. It’s padded, but all other rower seats are too. Rower seats, much like spin cycle seats, are notorious for being uncomfortable. That said, users haven’t complained much about the seat on this machine. Hydraulic rower arms can be fixed (meaning a set path) or open (meaning you can control the path they travel through). They can also have a single bar handle or 2 separate arms. The EFITMENT rowing machine has 2 “total motion” arms, meaning you have some control on the arm during your row. If you prefer, you can row with a wider arc, similar to the feel of rowing with oars on a boat. Since you do have some control over it, if you want to row with a more narrow, traditional pattern you can as well. At the end of each arm is a padded handle to help keep your grip secure and your hands comfortable. Most users agree the arm and piston operation of this rower are pretty smooth for the price. In this price range, it’s nice to see the 2 open arms because it gives you the freedom to customize your workout a little. It’s not uncommon to see these rowers costing north of $200. The Total Motion Rower comes with a lightweight, steel frame. The construction is a little heavier duty than most rowing machines in this price range. This is evident by the fact that this rower has a max weight capacity of 350 lb. This is literally 100 lb more than most hydraulic rowers. This, and the fact that this rower has a slide rail (inseam) 38″ long makes this one of the only hydraulic rowers capable of accommodating larger users. Fully assembled, this rower has the following dimensions: 63″ (L) x 23.8″ (W) x 19.7″ (H). At 63″ long, this rower is a little larger than most hydraulics, but it’s because of this extra length that taller and larger folks will be able to use it. It’s still about 2 ft shorter than most full size machines. With a weight of only 28 lb, it shouldn’t be too hard to move this machine around your home. It doesn’t fold, but you could store it vertically if you wanted to. Speaking of assembly, users all agree putting this rower together is pretty easy. Most users are able to assemble themselves in 15-20 minutes. No need to pay for the expert assembly on this one. Sometimes the footplates on hydraulic rowers don’t work. They can be small and shallow, causing your feet to slide out during your workouts. This doesn’t seem to be an issue on the EFITMENT rower. The footplates are pretty standard and use a large velcro strap to secure you in place. They do pivot slightly during your workout, something it seems all hydraulic rowers are doing these days. The idea is that the movement keeps your ankles in a more comfortable position as you extend your legs. There have been a few complaints from users about the footplates not fitting correctly or being warped. These seem to be cases of faulty products being sent out and would be covered by the warranty. You shouldn’t expect much from the monitors on these budget rowers. They tend to be small and unsophisticated. The monitor here is no different. It’s capable of tracking time, count, calories, total count, and strokes per minute. No workouts or heart rate monitoring here, but we shouldn’t expect those luxuries in this price range. Some users had issues with their monitors not working properly on delivery. Others noticed that some strokes weren’t counted accurately. Either way, these are issues pretty common to all budget hydraulic rowers. This may sound short, but for this price range it’s respectable. The fact is, budget equipment is budget for a reason and warranty is one of the areas you see a big difference in with higher end equipment. 3 years on a rower that costs under $150 is solid. The EFITMENT Total Motion Rowing Machine is a compact hydraulic rower with a robust frame. The total motion arms and adjustable resistance piston give you plenty of control over your workouts. It’s also backed by a pretty decent warranty, considering the price range. The biggest downside is that the piston gets really hot during use and should only be used for 20 min at a time. This is a problem most hydraulic rowers share, but even so, EFITMENT might want to address it somehow based on how many users have mentioned it. There are several similar rowing machines in this price range. I think the most impressive feature here, and the one that sets this rower apart from the others, is the 350 lb weight capacity. This is significantly higher than most rowers in this category. Overall, this is a solid little rower that continues to get high rankings from users. It’s also one of the only hydraulic rowers designed to accommodate larger folks. If you are big or tall and looking for a budget rower for your home, the EFITMENT Total Motion Rowing machine is a good bet. For Truly Golden Years, Start With Your Health!